By 1968, Jim had gathered a strong team together, able to produce not just brief appearances on variety or talk shows, but also a fully realized special like Hey Cinderella! At the same time, he was beginning talks with one of the writers on that program, Jon Stone, about Stone’s work in developing a new children’s show (Sesame Street which would premiere the following year). 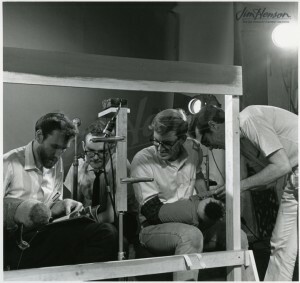 Perhaps those conversations inspired Jim to create a program for the Hershey, PA public television station that was geared to children and showed them how things worked behind the scenes. He taped an hour long program with Jerry Juhl, Frank Oz and Don Sahlin and then made three additional programs the following year. The public television audiences were relatively small, but Jim saw potential for this sort of show and pitched a series for commercial television in 1970. Unfortunately, he could not find a sponsor that shared his enthusiasm. Learn more about “The Muppets on Puppets” and see one of the 1969 episodes. Jim, Jerry Juhl, Frank Oz, and Don Sahlin on the set of a Wilson’s Meat commercial, 1964. This entry was posted in 06-June '68, 1968 and tagged Don Sahlin, Frank Oz, Hershey, Hey Cinderella, Jerry Juhl, Jon Stone, Sesame Street. Bookmark the permalink.